The Preferred Nodes page allows you to assign nodes to use for the resource. You also sequence the list of nodes to specify the preferred order that the nodes will be tried when a resource is brought online after its current node fails or if you do not specify a node when you bring the resource online. Changes are not allowed for the Preferred Nodes list for the Master_IP_Address_Resource. By default, a new resource is configured to run on all nodes, including future nodes. If its preferred node list is ever changed (directly or indirectly) by administrators, future nodes are not automatically added to the resource’s preferred nodes list. IMPORTANT:Ensure that you prepare the node for the services in the resource before you migrate or fail over the resource to it. If you are creating a new cluster resource, the Preferred Nodes page should already be displayed. If you are assigning nodes for an existing resource, the Preferred Nodes page is displayed as part of the Resource Policies page. You can start with Step 6. 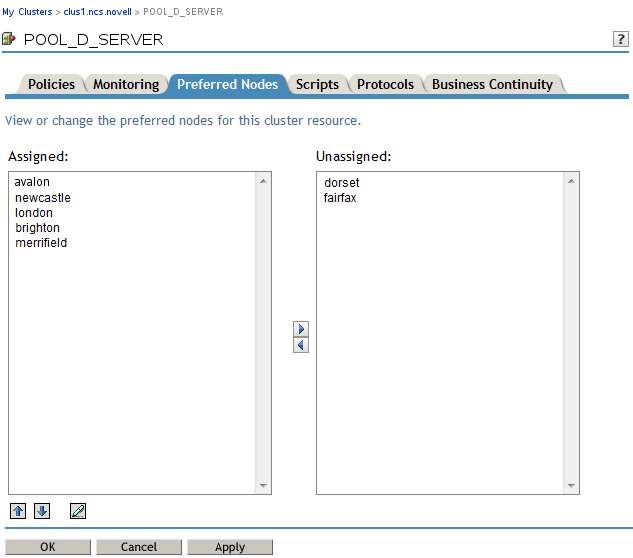 Select the cluster resource to open its Properties page. You can also select the box next to the cluster resource, then click the Details link. On the Properties page, click the Preferred Nodes tab. From the Unassigned Nodes area, select a node that the resource can use, then click the right-arrow button to move the selected node to the Assigned Nodes area. Repeat this step for all of the cluster nodes you want to assign to the resource. From the Assigned Nodes area, select a node that you want to unassign from the resource, then click the left-arrow button to move the selected node to the Unassigned Nodes area. Arrows: Select one of the assigned nodes by clicking on it, then click the up-arrow and down-arrow buttons to move the node up or down in the list. The page refreshes between each click on an arrow. 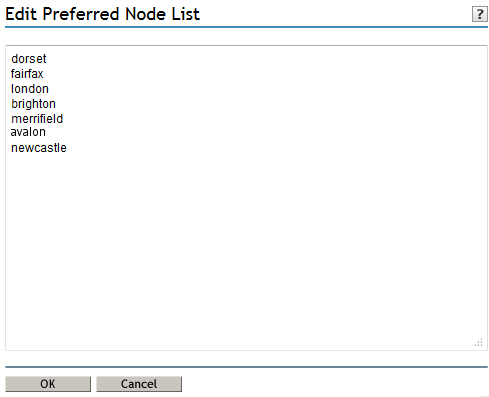 Edit: Open the Preferred Nodes Edit function by clicking the Edit pen icon, list the assigned nodes in the preferred failover order with one node per line, then click OK to accept the revised order. Be careful to not alter the names of the nodes while editing the list. If you remove nodes from the list in the Edit view, the removed nodes are automatically added to the Unassigned Nodes area when you save. At the bottom of the Preferred Nodes page, click Apply or OK to save the changes you made. The new list and failover order take effect immediately for OES 2015 and later clusters, with the latest patches applied. It can take a few minutes for eDirectory to synchronize so the node can retrieve the updated list. (OES 2015) Offline the resource, then online it again to apply the revised preferred nodes list and failover order. (Optional) Use the following command on the node where the resource is running to list the preferred nodes for the resource, and verify that the resource has the updated list.